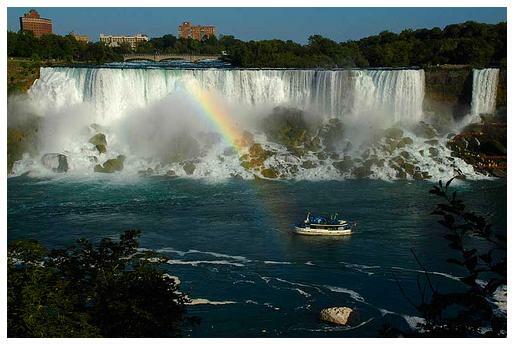 Here's a selection of Cool Background Images of Niagara Falls, New York. You can use them as backgrounds for your desktop. The city of Niagara Falls is home to America's oldest state park. During the Industrial Revolution in North America, the natural beauty of Niagara Falls became threatened by human progress. Industrialists had built mills and factories along the Niagara River to harness its power, while entrepreneurs bought up the land surrounding the Falls in order to control tourism dollars. Finally, a small group of people founded the "Free Niagara" movement, which held that the natural beauty of the land surrounding the Falls should be protected from exploitation, and free to the public. Group members urged New York state to reclaim the Falls and the area around it. The Niagara appropriations bill was signed into law in 1885, creating the Niagara Reservation, now known as Niagara Falls State Park. The law set a precedent for the protection of the nation’s natural resources, and heralded a major change in the basic attitudes of Americans toward their natural environment. For more of America's best cultural and natural attractions, more background images, and a wide assortment of free printable items, visit any of the links shown on this page. 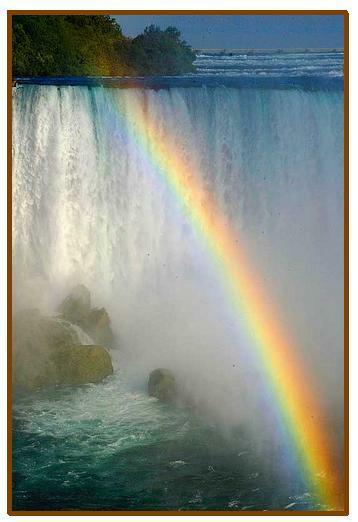 Niagara Falls attracts twelve Million tourists each year. 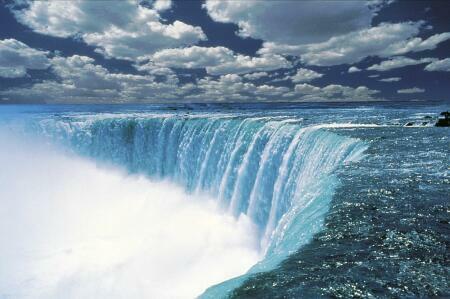 The Niagara river is about 12,000 years old (a microsecond in geological time). The river plunges over a cliff of dolostone and shale. Niagara Falls is the second largest falls on earth. (The largest is Victoria Falls in southern Africa). One fifth of all the fresh water in the world fills the four Upper Great Lakes - Michigan, Huron, Superior and Erie. The outflow eventually empties into the Niagara river and cascades over the falls. Click here for a complete visual list of U.S. State Flags, State Seals, and State Symbols. Go here for a broad assortment of Free Printable Images and Graphic Designs.